Russia’s Proton rocket returned to its Baikonur launch pad for a long-awaited comeback mission on Thursday, set to close a gap in Proton launch operations of a full year – the longest stand-down in the rocket’s five-decade service history. Liftoff with the EchoStar-21 mobile communications satellite is expected at 3:45 UTC and Proton will be in action for less than ten minutes before the Briz-M upper stage takes over for a nine-hour, multi-burn mission to maneuver the 6,900-Kilogram satellite into an elliptical Geostationary Transfer Orbit. 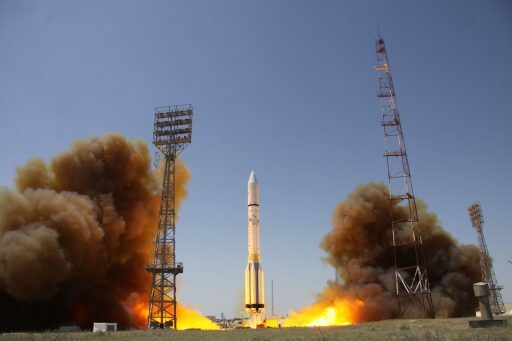 Proton last flew on June 9, 2016 with the Intelsat 31 communications satellite, encountering a close call when one of its four second stage engines shut down several seconds early – creating a shortfall in energy that had to be compensated by the rocket’s Briz-M upper stage. 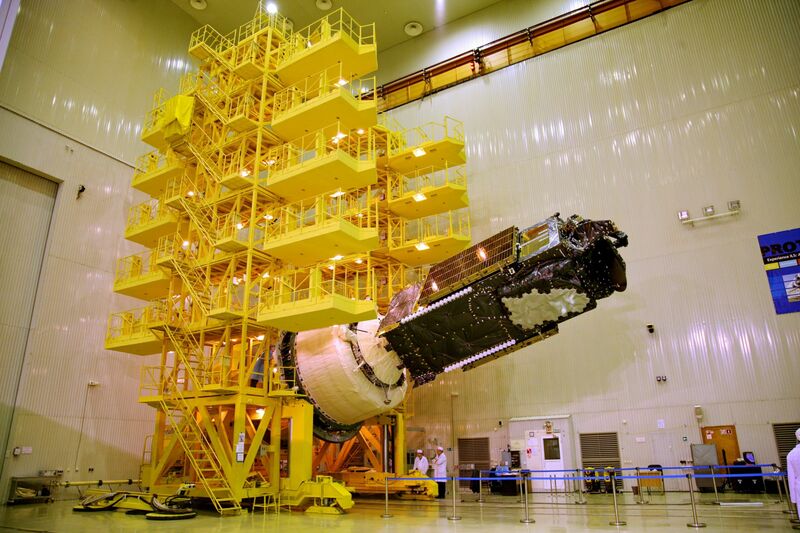 Although Intelsat 31 reached its target orbit, the event was put under detailed scrutiny and unveiled a massive quality control problem which ended up grounding the heavy-lift workhorse for one year. At the time of the June 2016 mission, EchoStar-21 had been looking at liftoff around August after already slipping repeatedly from a late 2015/early 2016 launch date. The inquiry into the sporty second stage shutdown with Intelsat 31 grounded Proton and subsequently delayed the launch of EchoStar-21 – first to November and then into December. With a late December launch date firmed up, EchoStar-21 arrived at the Baikonur Cosmodrome on November 22, flying from SS/L’s manufacturing base in California to the remote Kazakhstan launch base. 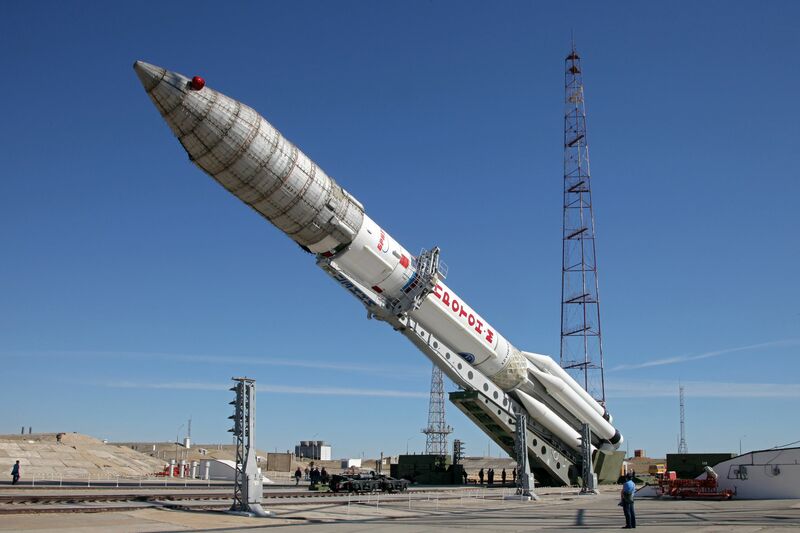 The satellite was fueled and, by December 23, had been installed on the fully assembled Proton-M rocket when a component issue on the first stage was discovered during pre-rollout testing. This issue was expected to be rectified at the launch site according to Proton’s commercial operator ILS to permit a January 2017 liftoff. 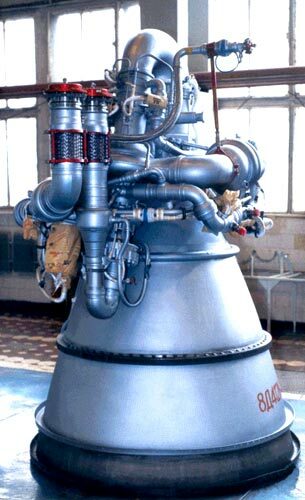 However, in the opening weeks of 2017, more troubling news emerged as part of the investigation into the December 1st failure of a Soyuz U rocket which focused on engine manufacturer VMZ that produces the Soyuz third stage engine as well as Proton’s second and third stage engines. 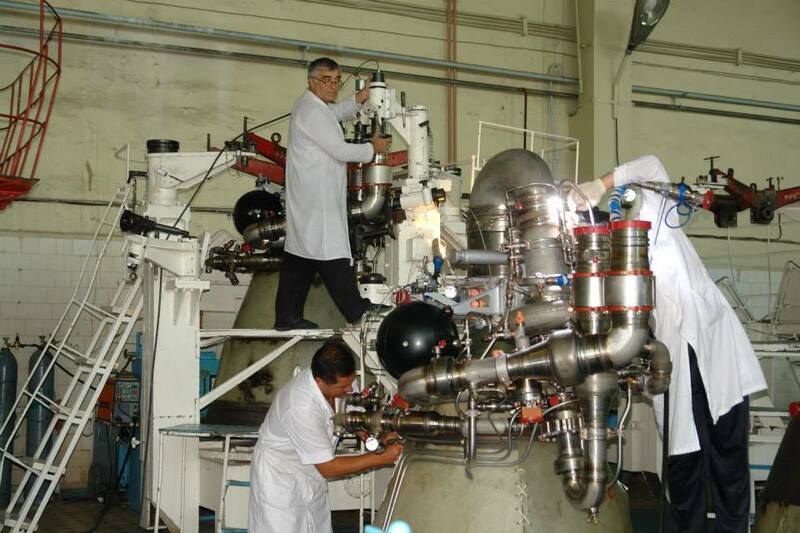 A decision to recall all RD-0110 Soyuz engines had already been made in the wake of the December failure which was traced back to a possible manufacturing defect on the engine’s high-pressure oxidizer pump. After a meeting in January, Roscosmos and VMZ managers also decided to recall Proton’s engines for inspections after acceptance testing of operational engines had shown persistent issues with the RD-0210/0211 and RD-0213/0214, both of which also have a history of in-flight problems most recently with Intelsat 31 for the second stage and in 2015 with MexSat-1 for the third stage. It was found that a solder joint connecting the fuel injector with the gas generator did not use the material specified for Proton’s production, introducing a potential weak-point in a critical component of the engine where liquid propellants turn into high-pressure, super hot gas to drive the engine’s turbopumps. Instead of the expected solder material, investigators found that the engines were produced with the same solder used on the RD-0110 of the Soyuz which has a lower melting point than that required by Proton’s hypergolic-fueled engines. It transpired that only a small quantity of the wrong solder material was used during Proton engine production, but it was impossible to trace down the engines with the defective material. This required a total of 71 engines for 14 rockets, produced between 2015 and 2016, to be recalled for disassembly, replacement of the gas generator, re-assembly and acceptance testing – a time-consuming process that is expected to take the entirety of 2017. 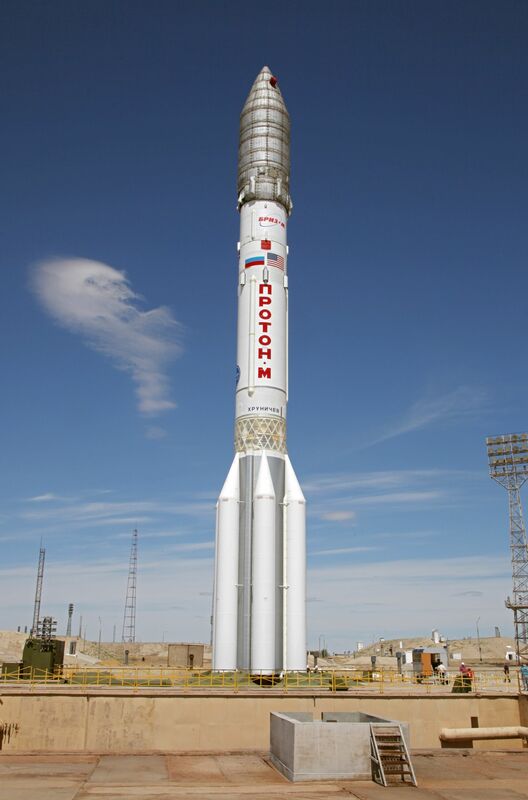 While Proton was grounded, Roscosmos also conducted a top-to-bottom review of the rocket’s systems and manufacturing techniques to uncover any design and manufacturing deficiencies. This review is designed to check components that have been flying for years or decades and have not yet been scrutinized by modern inspection techniques. The first batch of refurbished engines was delivered to Proton manufacturer Khrunichev in March & April and the three-stage rocket began its rail journey from Moscow to Baikonur on April 27 to undergo assembly and final inspections. EchoStar-21 was kept safe throughout the lengthy delay and entered joint operations in late May when it was installed atop the Briz-M upper stage and encapsulated in Proton’s protective payload fairing. 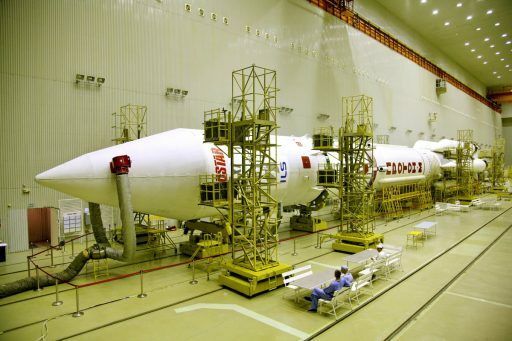 The upper composite comprising the satellite, fairing and Briz-M was integrated with the Proton rocket on June 3 followed by the rollout to the Briz-M fueling station where the upper stage received 19,800 Kilograms of hypergolic propellants to be used up during five burns of its main engine. 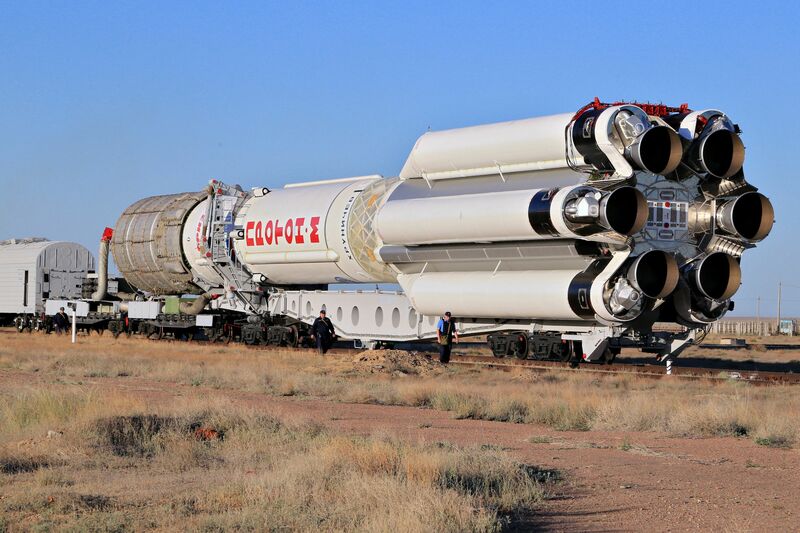 On Monday, Proton completed the last leg of its extraordinary long road to the launch pad, being moved from the fueling station to Site 81/24 of the Baikonur Cosmodrome. Arriving at the pad, the 58-meter tall Proton was moved into its vertical launch position and the large Service Structure was rolled up to the vehicle to provide access platforms for engineers. 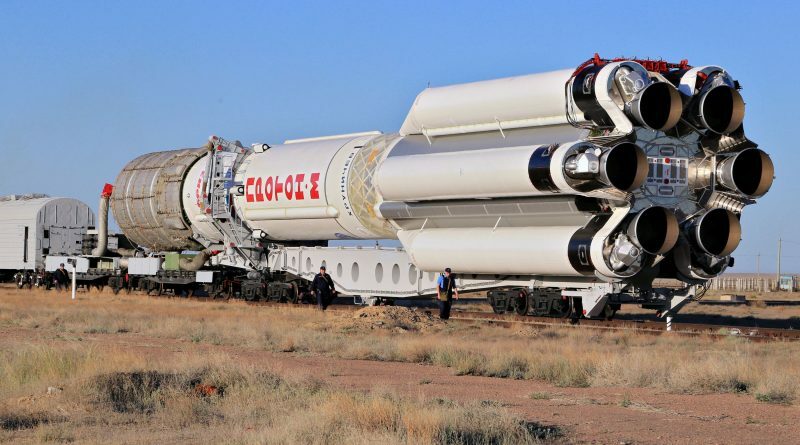 The Proton rocket is set for a three-day on-pad campaign to complete a final round of testing prior to heading into countdown operations Wednesday night for a 3:45 UTC liftoff on Thursday, 9:45 a.m. local time at the Baikonur Cosmodrome. EchoStar-21, operated by Colorado-based EchoStar Corporation, is part of the former TerreStar Network for Mobile Satellite Communications which was taken over by EchoStar in 2012. The first TerreStar satellite, now named EchoStar T1, launched in 2009 and took up station over the Americas to deliver coverage across the continental U.S. and the American territories. 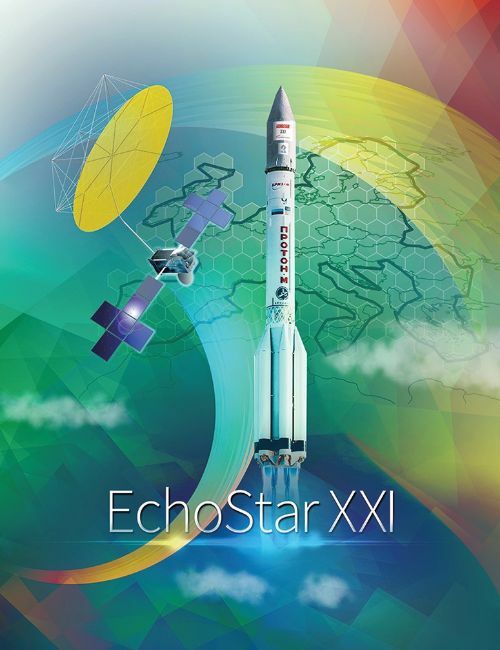 EchoStar-21 will serve Europe from a position at 10.25 degrees East in Geostationary Orbit, built by Space Systems Loral for a 15-year service life. Outfitted with a large deployable antenna reflector, the 6,871-Kilogram satellite will deliver capacity in the 2GHz S-Band, supporting voice and data communications, monitoring and messaging services, leveraging the ETSI GMR-1 3G air interface standard. The large unfurlable reflector and the powerful MSS payload can generate hundreds of communications spot beams to cover a large area of the Earth. A portion of the satellite’s capacity will be used by EchoStar Mobile’s next generation, all-IP enabled communications network. Proton-M countdown operations kick off 11.5 hours ahead of the planned 03:45 UTC launch time with the activation of the Briz-M upper stage for checkouts and software load. Proton-M is powered up seven hours ahead of launch for final setup steps ahead of propellant loading. Beginning the five burn mission, nine-hour mission, the Briz-M upper stage will ignite its S5.98 engine after a very brief coast to conduct a burn of four minutes and 17 seconds that puts the stack into a Low Earth Orbit 175 Kilometers in altitude for half and orbit of coasting set up for a long burn on the ascending node of the orbit with a duration of nearly 18 minutes to raise the apogee of the orbit to 5,000 Kilometers, placing the apogee passage close to the equator. Next is a coast phase of nearly an entire orbit so that the next burn can again take place around the perigee of the orbit, on the next ascending node, to continue raising the apogee to reach the desired altitude of 35,800 Kilometers. The third and fourth burn are conducted as a pair, amounting to a total of 17.5 minutes, only separated by a brief coast during which the spent Auxiliary Propellant Tank is jettisoned from the Briz-M after its propellant load of 14,600 kg is depleted. After the conclusion of the fourth burn, Briz-M will coast for five hours to be able to climb all the way up to the apogee of the orbit for the final burn of the mission that serves as a perigee-raising maneuver and a plane-change, reducing the inclination of the orbit. 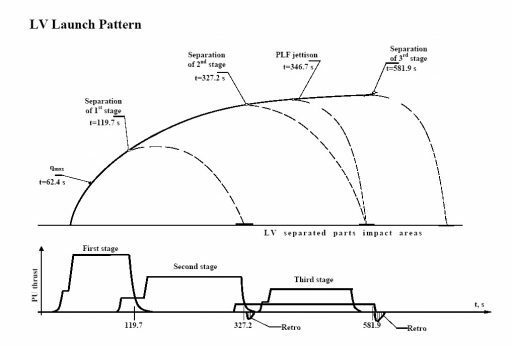 Spacecraft Separation is expected 9 hours and 13 minutes after liftoff into an orbit of 2,300 by 35,786 Kilometers, inclined 30.5°.